Kallbadhuset in Malmö is a traditional Swedish sauna at the end of a wooden pier that sticks out two hundred meters or so into the frozen Öresund. I go there when I am in Malmö in winter, to listen to the lively banter of red faced and naked Swedish males, drinking beer from shiny cans. Through the sauna’s windows, I watch boats moving with hourglass pace through the leaden sea, its dark, silent depths reflected in the gaping eyes of freshly caught fish at the local market. The sky is filled with the iridescence of the low afternoon sun setting close to the offshore wind park off the coast of Copenhagen, somewhere behind the Öresund suspension bridge, its RFID triggered barriers seemingly the only thing separating Europe and the polar circle. The stark platonic volumes of Helsingborg’s power station float effortlessly in the endless distance and Calatrava’s turning torso winds into a hazy sky nearby, albeit only to half its intended size. A cross country skier glides across the ice into the foreground in vintage ski wear and a remaining flock of geese flies south. For a moment, the world seems like a slow-moving mobile powered only by the orange ember crackling in the hearth in front of me. Wearing nothing but a pair of large black plastic frames, I take in this breathtaking view through large high-refractive plastic lenses, on which minuscule crystalline fissures have started to form in the sauna’s intense heat, slowly tessellating the anti-scratch coating beyond repair. I had already almost lost them in the sound, plunging into cold amniotic waters through a circular opening in its frozen surface. When the architecture recedes as scaffold, the life it supports pops forward, which is why I like the propped up makeshift feel of the great Anglo-Saxon cities, prior to Giuliani and his imitators, or Madrid, prior to EU funding and the ensuing flotilla of pavement cleaning vehicles. I spotted a familiar large neon sign on the roof in one of the photos. It looked like it was from the fifties. I could never figure out why it was still there and had even survived the building’s recent renovation. With neon circles rippling from what appeared to be a pair of eyes, I always thought of it as an owl standing guard, trying to hypnotize me while I wait for the green light at the intersection of Greifswalder Straße and Am Friedrichshain, where once stood the king’s gate or Königstor. The Prussian king Frederick William III passed through it in December of 1809 on his return from Russia, where he had found refuge from Napoleon. On an intermediate level of consciousness, I somehow associated the sign on the roof with the optician below when I read that the Bösche business had been there since the 50s. The service was great and the staff very friendly and chatty, even though I had a hard time following Herr Bösche’s deliberations on the current state of optometry in this country through the eye-test glasses that were seriously distorting my already strong astigmatism. Opticians and dentists seem to share a tendency to debilitate their subjects with medical instruments before subjecting them to lengthy monologues. It was the flak tower of nearby Volkspark that had protected the neighborhood from allied bombings. Pilots simply tried to avoid its reach. The conquering Russian army turned left off what is today Karl-Marx-Allee to get to the center, sparing this neighborhood. Where today townhouses in the British style create an air of the Cote d’Azur at Schweizer Gärten, there used to be a recreational park, with a ball room much like Clärchens, and a coffee pavilion. People brought their own cake and bought coffee. We discovered we shared a certain distaste for our city’s recent obsession with superfluous pedestrian lights and other Keynesian measures to jump start the local economy. The Lebanese shop owner around the corner collects old post cards of the area. Just after unification, East Germans craved Italian and Chinese food. The famous Chinese restaurant across from the Chinese embassy started here during that time before moving to its current location when locals developed a taste for fake Mexican and Thai or Sushi cooked by Vietnamese. I asked him about the large neon sign on the roof of the building. It’s an advertisement for an R-F-T BG 19 or Smaragd, maybe ca. 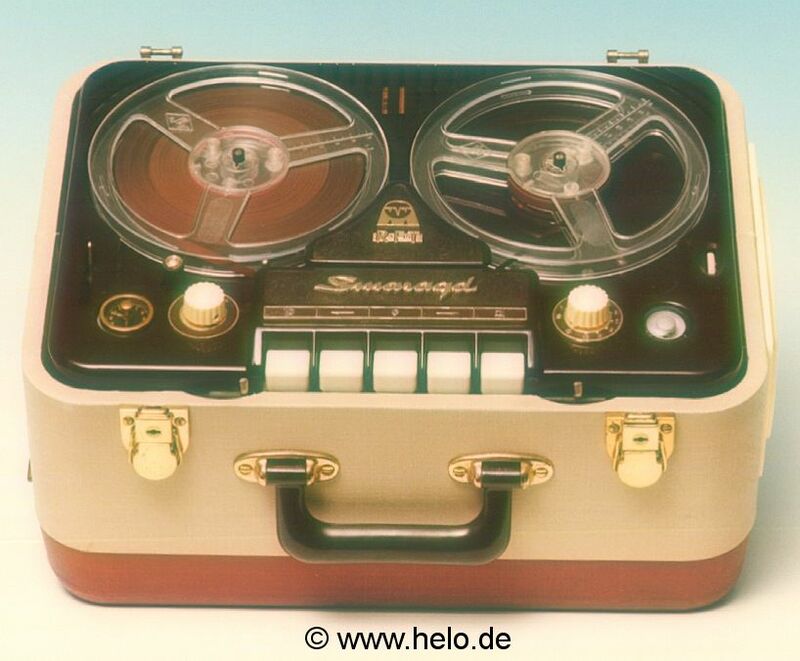 1951/52, a GDR tape recorder. Apparently it’s structurally so intertwined with the building that they haven’t been able to demolish it. The advertisement was for a different range of the electromagnetic spectrum than I had inferred with my owl analogy. Sound is this sign’s subject, not vision. I appreciate the physicality of the fabricated sign over the digitized flatness of the ubiquitous fabricated image and wonder how many conversations start over a megaposter. There’s something here about the animation of inanimate buildings (Immobilie in German). I should look up John Hedjuk.